With SyvirMon you can receive alerts when your computer is under heavy workload. SyvirMon does not intercept and change any data on your computer, the program just monitors changes that take place on your system. 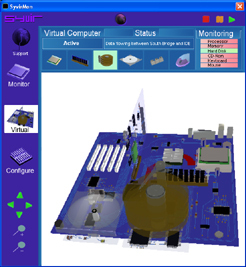 Once the program is loaded into the System tray, SyvirMon can be left to monitor your computer in the background. When in Monitor mode SyvirMon produces three alerts based on the workload of your system. A Red icon appears in the system tray when the computer is under heavy workload. A green icon means the computer is running OK!.